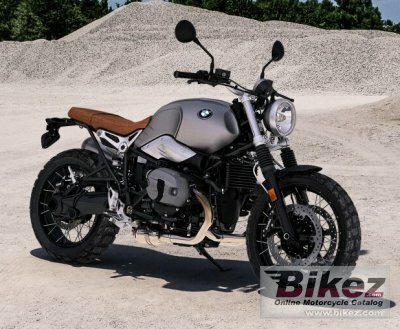 2018 BMW R nineT Scrambler X. Picture credits - BMW. Submit more pictures. The cross-spoke wheels with studded off-road tyres make it clear from the first glance that no tour need be over when the road comes to an end. The seat in leather style and the speedometer with analogue display are also eye-catchers. High-quality details like the round headlights with BMW emblem make the classical heritage look perfect. Wheels: Cross Spoke Wheels. On-Road or Off-Road Tyres. Ask questions Join the 18 BMW R nineT Scrambler X discussion group or the general BMW discussion group. Bikez has discussion forums for every bike. View comments, questions and answers at the 2018 BMW R nineT Scrambler X discussion group. You can sign up for e-mail notifications when other riders answer you. If you have extensive experience with the MC, please send us a review. If you consider buying this bike, you should view the list of related motorbikes Look at photos. Compare technical specs. And check out the rating of the bike's engine performance, reliability, repair costs, etc. You can compare the rating with other bikes.